A Henri Matisse painting stolen in 1987 was returned to Stockholm’s Museum of Modern Art on Wednesday, while details about the theft and where the work has been for 25 years remain a mystery. Stockholm's Museum of Modern Art celebrated Wednesday the return of a Matisse painting stolen 25 years ago, but details about the theft and where the work has been for a quarter-century remain shrouded in mystery. Henri Matisse's "Le Jardin", an oil on canvas from 1920 now worth about $1 million (750,000 euros), was stolen from the museum on May 11, 1987, when a thief or thieves broke in with a sledgehammer and made off with the painting in the early morning hours. The museum announced Wednesday that "Le Jardin" had been "brought home from London", after it was found when an art dealer based in Britain ran it through a global database of stolen art -- standard practice before a sale. 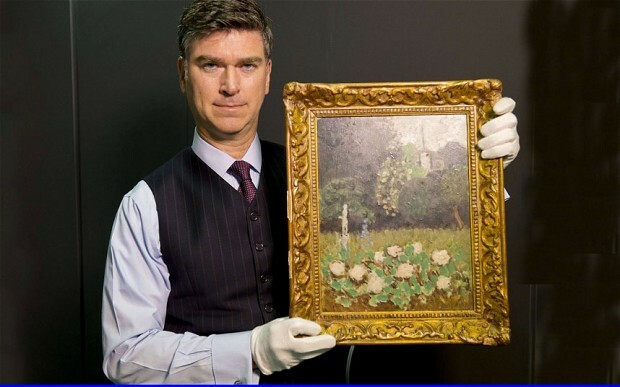 The team at the database company quickly identified the painting, which depicts a garden of white roses in the foreground and bushes and trees in the background, as the one stolen from the museum, and together with the dealer helped secure its return home. "It's a welcome return," said Daniel Birnbaum, the museum's director. "Right now the painting is in its transportation case," the museum said in a statement, adding that the artwork would need 24 hours to acclimatise to its new surroundings before being unpacked and shown to media on Thursday. In Sweden, the statute of limitations on art thefts is 10 years and so there is no police investigation under way. The thieves' identities will likely never be known, nor the painting's whereabouts since 1987. The dealer who helped find the painting, Charles Roberts, said he had been asked to sell it by a representative for an elderly man in Poland who had owned it since the 1990s and now wanted to raise money for his grandchildren. "I didn't anticipate hearing that it had been stolen. It came as quite a shock to find that out," Roberts said earlier this month. The Polish man had bought it "in good faith" and "for a substantial sum", he said, and when he told him it was stolen and could not be sold, the man "was bewildered, taken aback, although he did say, 'So it definitely is a real one?'" Christopher A. Marinello, asked Roberts to proceed as if the sale were going to take place to get the painting to Britain, then confirmed it was the real thing. He then negotiated its release. Roberts has remained tightlipped on the identity of the Polish man, who has requested confidentiality and has not come forward to tell his side of the story. "We don't know where in Poland he's from, nor whether he's 85 years old, nor whether he really exists," said Christopher A. Marinello, an art recovery specialist and lawyer. It is not known how the painting ended up outside Sweden. Small in size (34 centimetres x 45 centimetres), it could easily be removed from its frame, "rolled up and take up no space at all," a police investigator said. A museum spokeswoman denied attempts had been made to ransom the painting. The director of the Swedish museum at the time of the theft had told reporters the artwork was too well-known to sell on the open market, and this is likely why it had been missing for so long. Stolen art "rarely turns up at auctions, because the objects on the block can be seen by a lot of people in a catalogue and online and thieves usually want to avoid the public domain," explained Anna-Karin Pusic, of the Bukowski auction house in Stockholm. The stolen art market is estimated at between $6 billion and $7 billion per year, according to Marinello. "Stolen artwork has no real value in the legitimate marketplace and will eventually resurface," he said. "It's just a matter of waiting it out."